In addition to tenured professor Thane M. Naberhaus and faculty advisor Ed Egan, Newman also demanded and received the resignation of university provost David B. Rehm, who was previously critical of Newman’s retention plan. Another faculty member, Gregory W. Murry, suspects he is next in line to be out of a job. The Foundation for Individual Rights in Education (FIRE) demands that the fired faculty members be reinstated and that dissent and a free student press be respected on campus. The firings come after a Mount St. Mary’s student newspaper, The Mountain Echo, published a story on January 19 highlighting Newman’s idea to use a survey to identify and dismiss 20–25 potentially low-performing freshman students in order improve the university’s student retention rate. Several faculty and administrators had expressed misgivings about the program. 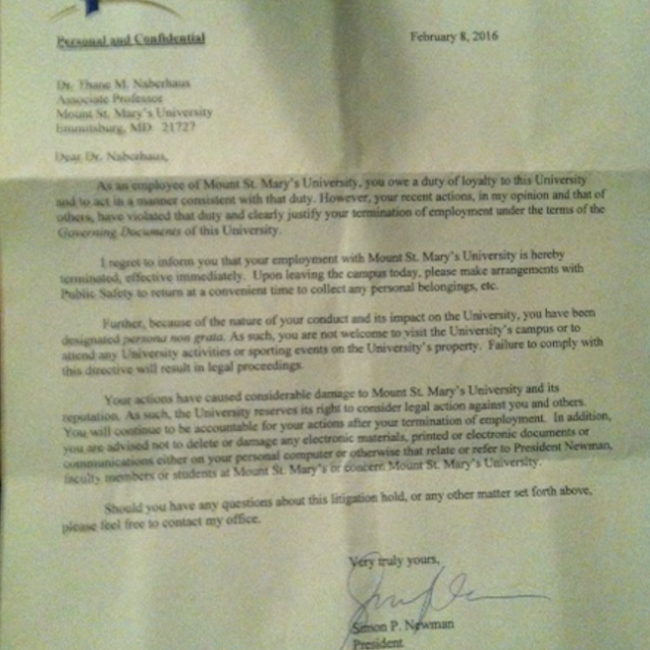 The university notified Egan and Naberhaus of their firings by letter. Egan, a former university trustee, was the Echo’s advisor and the director of the university’s pre-law program. Naberhaus was a tenured philosophy professor and had raised concerns about Newman’s retention program on a handful of occasions. A campus spokesman confirmed to The Chronicle of Higher Education that both faculty members were no longer with the university. Naberhaus told the Chronicle that he received his letter, signed by the president, from a security officer, who confiscated his computer and escorted him to his car. The letter stated that Naberhaus had been designated “persona non grata” at the university and was no longer welcome on campus or at any university activity, and that failure to comply with the letter would result in “legal proceedings.” Egan told The Frederick News-Post that he hadn’t seen Naberhaus’ letter, but he believed his was similar. A third professor strongly suspects he will be fired as well. Assistant professor of history Gregory W. Murry, who had informed the Echo about Newman’s “Glock” comments, told the Chronicle that he was called into a meeting with administrators but received the request after leaving campus. He did not attend the meeting and was subsequently locked out of his email account. FIRE is a nonpartisan, nonprofit educational foundation that unites civil rights and civil liberties leaders, scholars, journalists, and public intellectuals from across the political and ideological spectrum on behalf of individual rights, freedom of expression, academic freedom, due process, and rights of conscience at our nation’s colleges and universities. FIRE’s efforts to preserve liberty on campuses across America can be viewed at thefire.org.